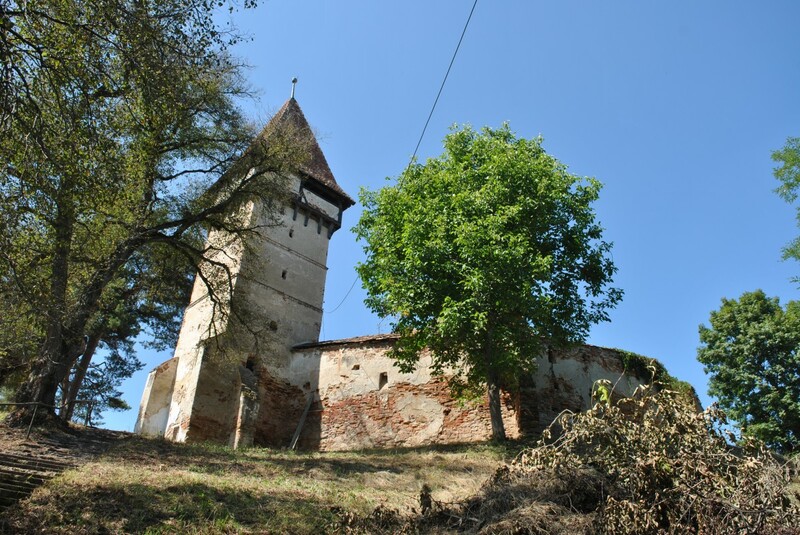 Within the framework of the cooperation between the Patrimonium Saxonicum Foundation and the Fortified Churches Foundation, important protective and preventive measures are carried out at selected fortified churches. This initiative is intended to show that with conscious and planned action, as well as professional technical measures, churches and fortified churches can be protected – even with smaller sums of money. The first collaboration took place in 2017 at the fortified church of Pelișor. Within the project 17 trees were felled – 7 of them of a larger size – and shrubs and unwanted vegetation were removed. In the castle courtyard scrub was removed and some rubble was collected. The collapsed, wooden, covered staircase to the bell tower was removed and stored. In addition, the restorer L. Kiss prepared an expertise on the architectural surface. This action considerably reduced the acute threat to the castle complex and enabled further donations to be raised from third parties. These are to be used in 2018 for further measures (removal of building rubble, roof repairs). Furthermore, a static report is to be prepared in 2018 as part of the joint programme of the Fortified Churches Foundation with the European University Viadrina (Frankfurt/Oder), the Transylvanian-Saxon Cultural Council and the Superior Consistory of the Evangelic Church A.C. in Romania. For the year 2017 approx. 3700.00 EUR were spent in Pelișor.